Persepolis FC goalkeeper Nilson Corrêa Júnior says people should not analyze goalkeeping performance base on penalty kicks. Nilson recently saved his goal from a penalty kick during the game against Foolad Ahvaz FC. “I have saved many penalty kicks during my career and I will try to do more in future. But in my opinion analyzing goalkeeping performance base on penalty kicks is not a wise job. For example a goalkeeper may only save one penalty kick during ten games but sometimes he might save three or more penalties in a row. So it is better to analyze each goalkeeper base on his overall performance.” Nilson Júnior said. He also praised his main rival in Persepolis FC by saying: “I believe in Shahab Gordan and I am sure that he can restore his position in National football Team of Iran in soon future. I’m very happy with my performance and keeping the current situation is too hard. So I will continue my hard working here. I think it’s all up to my trainings.” Nilson added. Currently he is the number one goalkeeper in Persepolis FC after Gordan upset fans and coaches of his performance and blunders in first matches in Iran Pro League. He was even benched by Manuel Jose for 75th Tehran Derby. “Everything is fine here and I have adopted myself with the conditions. But I am suffering from language (Persian) problems.” The Brazilian goalkeeper talked about his living style in Tehran. 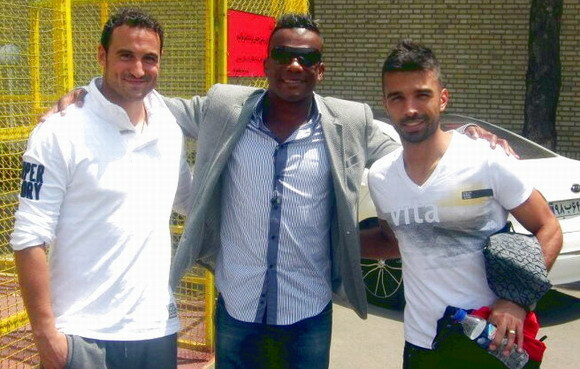 Nilson joined Persepolis FC from Portuguese club, Vitória Guimarães. On 17 July 2012, aged nearly 37, Nilson signed a one-year contract with Iranian giant.